This charming, madcap Victorian romp was originally published in 1997 and has just recently been translated into English and reissued by First Second. 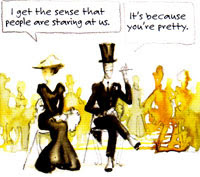 The French pairing, Joann Sfar and Emmanuel Guibert, have infused their girl-meets-mummy love story with equal amounts whimsy and longing. Lillian Bowell is the daughter of renowned Egyptologist Professor Bowell. During one of her father's many absences, Lillian befriends one of her father's many mummies, Imhotep IV. Lillian soon feels safe with the debonair mummy and Imhotep finds the lovely lady reminds him of his long-dead wife who was not mummified and therefore will not be around to enjoy eternity with her spouse. Together these two unlikely confidantes spend a day out on the town, strolling through the streets and parks of 19th century London. Mayhem ensues when Imhotep gets into a drunken pub brawl and Lillian is forced to drug the police who come to investigate the matter. Unfortunately, the sedative turns out to be poison and Lillian is put on trial for murder. Both fathers attempt to come to the rescue of their besotted children, but the British justice system will not be perverted and the two lovers must find a way out on their own. Always zany, at times hilarious, this original tale rushes headlong toward a satisfying, if slightly cringe-worthy conclusion. The text is enchantingly abrupt and fast-paced, and the accompanying artwork is utterly beguiling. Highly recommended. 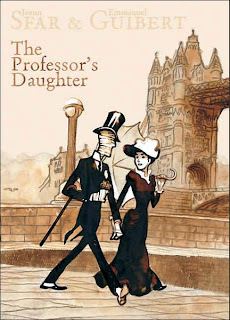 The Professor's Daughter is a 2007 Cybils Finalist.